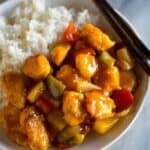 Restaurant style Sweet and Sour Chicken is made with baked chicken, bell peppers, onion, pineapple, and a quick and easy Sweet and Sour Sauce. It’s easy to make and even your pickiest eaters will be going back for more. The only think better than the Chinese food from my favorite local restaurant is homemade Chinese food! Nothing can replace real, healthy ingredients prepared fresh in your kitchen! I love to serve chow mein with Mongolian Beef, Ham Fried Rice, and a host of other easy Chinese food recipes! Who doesn’t love sweet and sour chicken, am I right?! It’s one of my favorite things to order at a good Chinese restaurant—but I’ll put emphasis on the “GOOD restaurant” part of that statement. 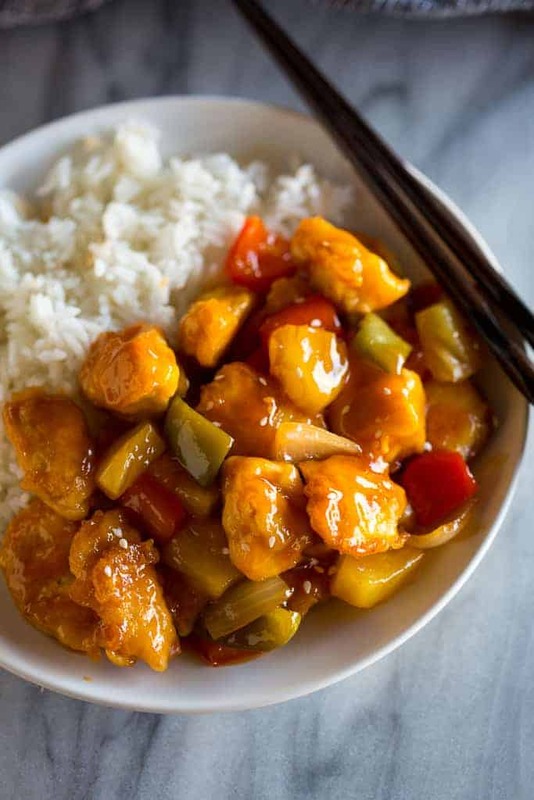 If you’ve ever ordered sweet and sour chicken from a mediocre Chinese restaurant, it could completely ruin the dish for you. It’s just one of those dishes that I’m picky about I guess. It’s easy to tell if it was made using a bottled sauce, or a homemade sauce; there’s a huge difference in taste! This homemade sweet and sour sauce is a total winner. I can’t tell you how many recipes for sweet and sour chicken I’ve tried over the last few years and most were to ketchup-y and others were too vinegar-y. After a little tweaking and experimenting, this sweet and sour sauce has the perfect blend of flavors and seasoning for the chicken. First cut the chicken into one inch chunks and season it with salt and pepper. 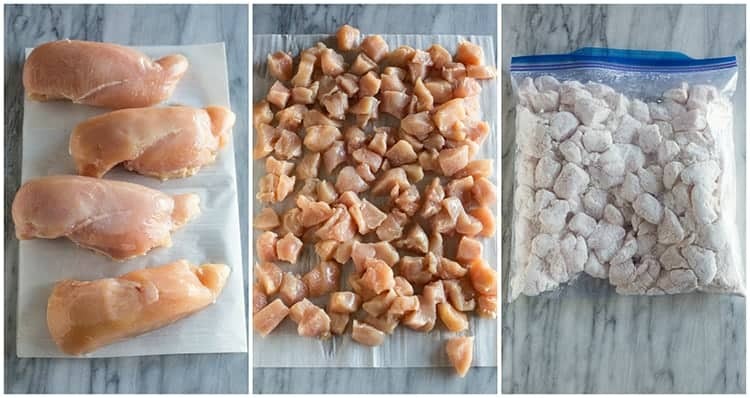 Add the chicken and cornstarch to a large ziplock bag and shake to coat each piece evenly. In a small bowl, beat the eggs. In a large skillet, heat the oil. Dip the chicken pieces in the eggs and place them carefully in the hot skillet. Once they are golden brown on the outside (but still raw inside), place them on a large baking sheet. Bake them at 400 degrees for about 15 minutes or until cooked through. In the meantime, add bell peppers and onion to the skillet and cook them for a few minutes. Add the pineapple. In a small bowl, mix all the the sauce ingredients for the sweet and sour sauce. Pour the sauce over the veggies and cook until the sauce is thickened. Remove the chicken from the oven and pour the sauce and veggies on top. Toss everything together on the sheet pan until evenly coated. Serve immediately with hot cooked white rice, brown rice, or even a side of fried rice! In a small bowl, mix all of the ingredients for the sweet and sour sauce together (sugar, ketchup, apple cider vinegar, soy sauce, garlic salt, and cornstarch). Stir to combine. 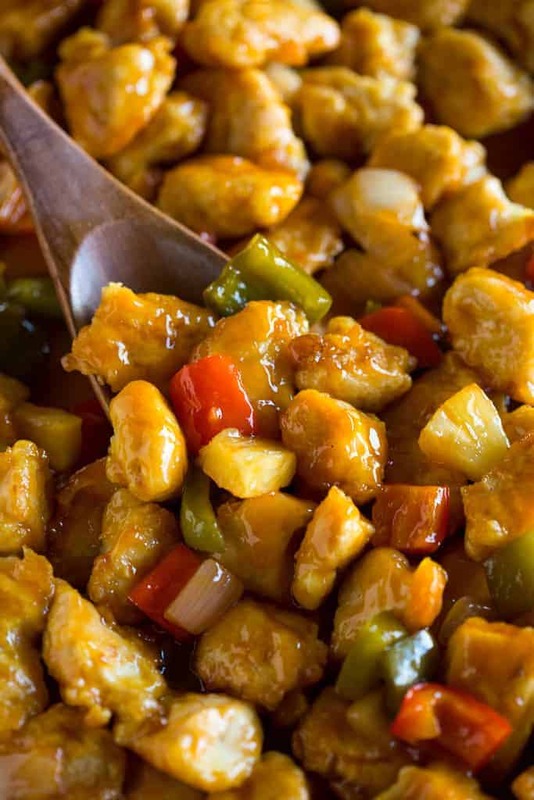 I like to pour the sweet and sour sauce over bell peppers, onions, and pineapple and serve it with hot baked chicken as sweet and sour chicken. 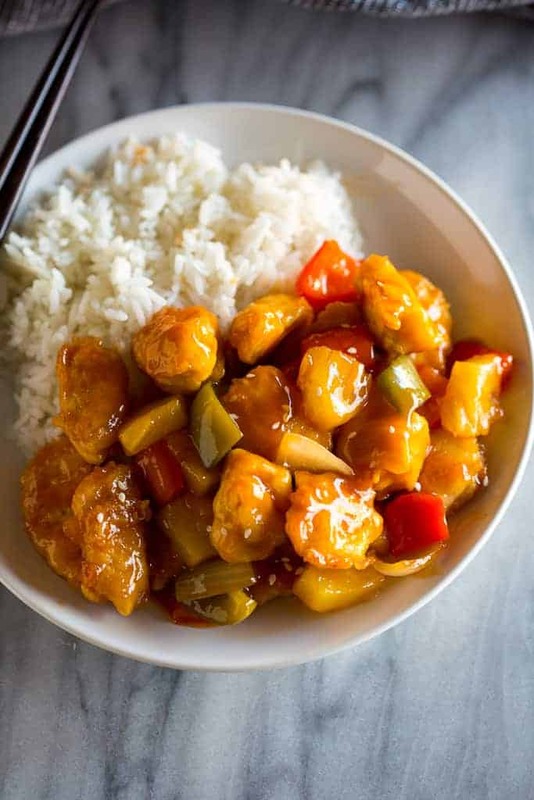 Restaurant style Sweet and Sour Chicken is made with baked chicken, bell peppers, onion, pineapple, and a quick and easy sweet and sour sauce. Cut the chicken breasts into 1-inch chunks and season with salt and pepper. Place the cornstarch in a large ziplock bag; add the chicken pieces and toss to coat the chicken evenly. In a shallow bowl beat the eggs together. Heat the oil in a large skillet over high heat. Dip the chicken pieces in the beaten eggs and place them carefully in the hot skillet (you will need to coat and cook the chicken in batches), and cook for just about one minute on each side, until golden and crispy, but not cooked through. Add the chicken to a large rimmed baking dish. Bake at 400 degrees F for 12-17 minutes or until the chicken is cooked through. Meanwhile, add the bell peppers and onion to the skillet and saute for 2-3 minutes. Add pineapple. Mix the sauce ingredients together in a bowl and pour into the skillet with the veggies. Cook, stirring, until thickened. Remove chicken from oven and pour sauce and veggies over the top. Toss to coat. Serve immediately with hot steamed white or brown rice. *I originally shared this recipe August 2014. Updated January 2019. 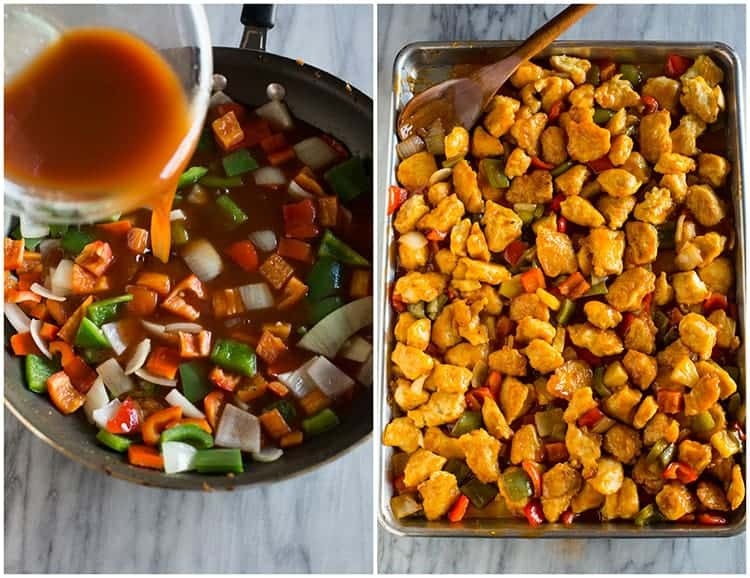 We are really big fans of Chinese food at our house and my husband thought this was the best sweet and sour chicken he had had! I’ll be saving this recipe and sharing it with others! This was so good! We loved it! Where’s the original recipe you posted for sweet n sour chicken? I like that one better. Sure! I just found that it was such a large amount, it was easier to toss in the baking sheet. This was DELICIOUS! I used fresh pineapple and only 1/4 cup of Truvia.